Many residential chimneys are finished with stone or brick to help insulate them and provide a traditional appearance. However, a masonry chimney may begin to show its age over time. Replacement and resurfacing can be expensive, which makes cladding a masonry chimney with siding an attractive option in some instances. Installing siding on a chimney requires a layer of wood furring that serves as a base for the siding itself. You can only install siding on a chimney if there is sufficient clearance between your furnace, fireplace or stove and the chimney's exterior to prevent the risk of fire. 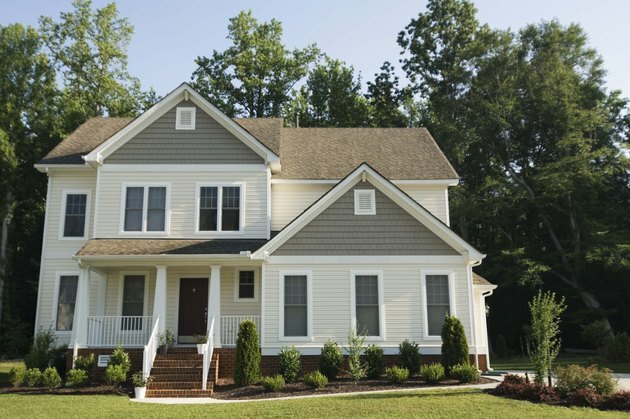 Siding can give a home's exterior a consistent look. Screw pressure-treated 2-by-4s vertically to the surface of your chimney with masonry screws and a power driver. Create two columns of furring that extend from a few inches above the ground to the top of the chimney. Set up a ladder to install furring on the higher portion of the chimney. Space the masonry screws about a foot apart and leave at least 1 foot between the two furring columns. Use a tape measure to check that the distance remains consistent as you work upward. Attach insect screening near the bottom of the furring columns by screwing galvanized screws into the furring. Wrap the screening around the furring so that it extends to each edge of the chimney and prevents insects from entering the space between the siding and the masonry surface. Position a piece of siding that has been pre-ordered and cut to the width of your chimney against the wood furring near the bottom of the chimney. Check that the siding is even horizontally with a level. Hammer the siding into the furring through its mounting holes with corrosion-resistant nails. Leave a 1/16-inch of space between the nail head and the siding surface. Position the next piece of siding above the previously installed piece. Leave a 1/4-inch of space between rows of siding and hammer it into the furring in the same manner as with the first piece. Repeat the process until the siding reaches the top of the chimney. Take off the chimney cap by removing the screws that hold it in place. Replace the cap once the top row of siding is in place.